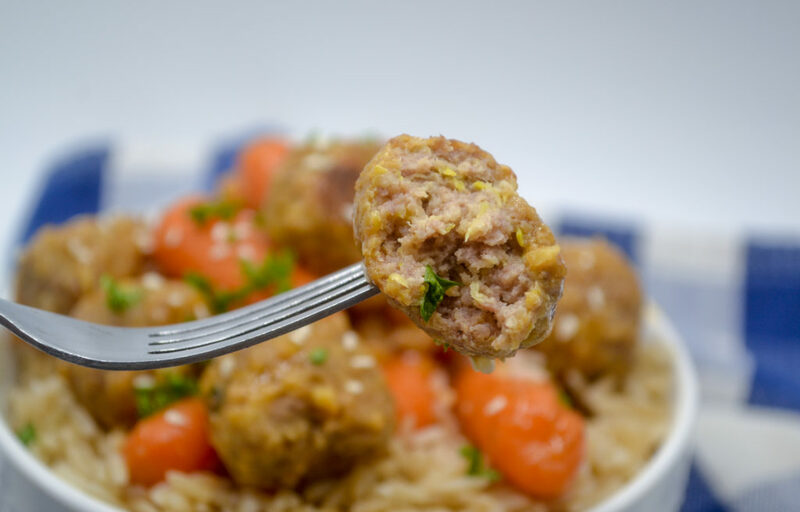 Chicken Teriyaki Meatballs are the perfect combination of sweet, savory, and kid friendly. Sweet, pineapple soy meatballs are packed with grated zucchini to create a delicious teriyaki flavor. 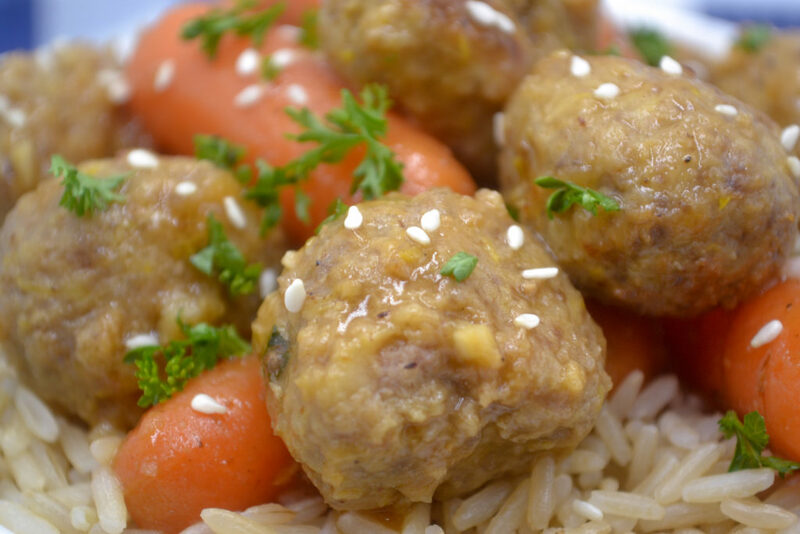 A simple teriyaki pineapple sauce pairs with hidden veggie Asian meatballs to make a healthy dinner for picky eaters. Serve over rice for a simple, kid friendly dinner. Every birthday for years my inevitable request for my birthday dinner was to go to hibachi. The noodle, rice, veggies, and amazing chicken is my favorite dinner to indulge in – not the healthiest option known the man, but so delicious. Now we mostly go every Christmas with my MIL and the boys. While entertaining with the food being made in front of you, onion volcanoes, and the always hilarious “trying to catch veggies in your mouth”, getting 2 kids to sit still for along dinner like that is ugh. 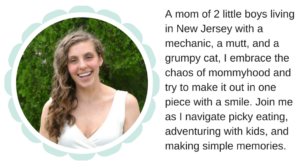 A few weeks ago I was trying to figure out what on Earth to make for dinner (what else is new, right?) when I got a random craving for Hibachi – you know, the Japanese steakhouse places that cook your meal right in front of you? It’s seriously my favorite and usually my birthday dinner request. Given that it was a random Wednesday, there was no way I was going to pack up 2 hangry kids, beg the husband to go, and spend an ungodly amount on dinner. (okay, so I totally did consider it.) I needed a way to make something to squash the craving at home. Preferably, in a quick, healthy, kid friendly fashion. Fresh ginger will give you a stronger, fresh taste. If using fresh, grate it with a microplane or box grater. I used grated yellow squash. Grate on the finest shred of a box grater so you don’t have big chunk. If using zucchini but think your kids will be put off by the green, try peeling it before you shred. Even if you don’t need the hidden veggies, don’t skip the squash in these chicken teriyaki meatballs – it adds a ton of moisture, which is much needed with the chicken meatballs. These chicken teriyaki meatballs are one of my favorite kid friendly dinner ideas – kids love the meat balls and sweet flavor of the teriyaki pineapple sauce, while you can enjoy the fact that the meatballs are packed with veggies. Customize them to fit your families needs and wants – you can use zucchini or shredded carrot in place of the yellow squash. Instead of turkey, try ground chicken, pork, or beef in place. The shredded vegetables help keep the meatballs super moist, so they are more forgiving to overcooking and lower fat meats. Chicken Teriyaki Meatballs with Teriyaki Pineapple Sauce are the perfect combination of sweet, savory, and kid friendly. Sweet, pineapple soy meatballs are packed with grated zucchini to create a delicious teriyaki flavor. Bake for 20 minutes, flipping halfway through. While they are baking, remove fruit from the juice (save the juice!) and chop to your desired size. Remove the meatballs from the pan and put the pan on the stove over medium heat. Cook another minute or two, and then serve over rice and sprinkle with sesame seeds. Feel free to play with the meat used - hidden veggie meatballs tolerate lean meats well since the veggies add a lot of moisture. Sesame oil is totally optional, but adds a ton of flavor. If you regularly cook Asian food, definitely grab a small bottle. Use sparingly as the flavor is huge. Okay so tell me – have you ever had hibachi? Does your family love it? Let me know in the comments!